The conceptual artist On Kawara has produced an ongoing series of "date paintings" (the Today series), which consist entirely of the date on which the painting was executed in simple lettering set against a solid background. If the painting could not be completed on the day it was begun, it was destroyed. 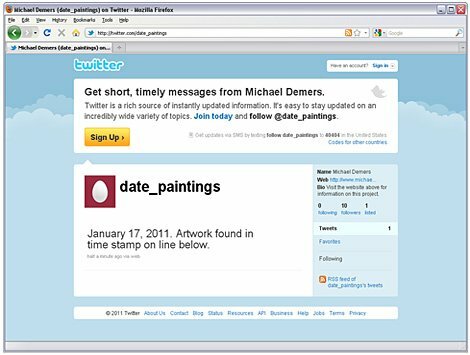 Date Paintings (Twitter) differs in that the creation of the actual date painting relies on the dynamic time stamp of the tweet. Once the tweet is 24 hours old the time stamp becomes static, and at that point the painting is destroyed.